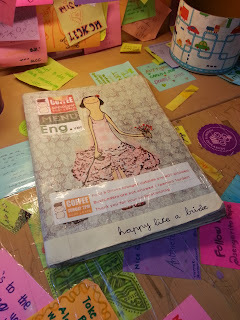 It is Sunday, 1PM and I am at Sunday 2PM, a mini book cafe tucked in the corner of Sarrosa Hotel. I have been summoned to tag along to act as a PA or Personal Assistant PE or Props Eater for a photoshoot (tigkaon sa mga props paghoman sa photoshoot). The cafe opens at 2PM on a Sunday, but our six–man team was in the cafe an hour before opening time. The owner was kind enough to open the cafe early (the bride–to–be asked permission thru phone a few days in advance). 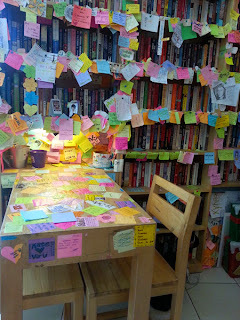 ...and getting my picture taken for Sunday 2PM's facebook page. Ha! Just kidding. 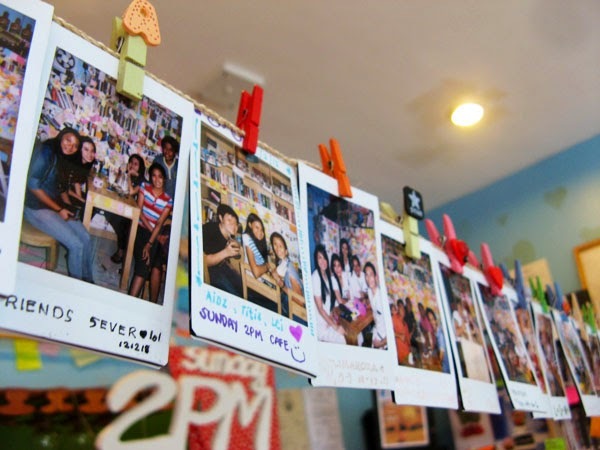 The cafe has a photobooth by the counter. 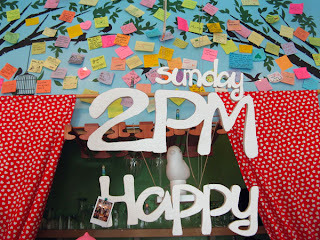 Photos taken at the booth will be automatically uploaded to Sunday 2PM's facebook page. The time came to wrap up the shoot and do my duty: consume the props. First in line: pink lemonade slush. The first word that registered upon first sip: sweet. Second: Cold. 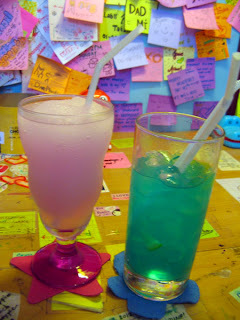 This icy cold and very sweet drink is an excellent drink to have on a very hot day. Drink number two: blue lemonade. This, compared to the pink lemonade, wasn't too sweet. If I had tried this before the pink one, I'm not certain I'd have the same opinion. It could just be the pink sugar being stuck to my tongue. 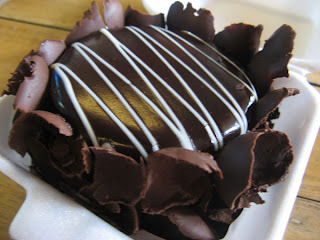 The Chocolate Sin mousse was put in a take out box for later consumption. Later consumption came. Moist, triple chocolate, sinfully sugary, this cake is meant to be shared. But not meant to be paired with either of the two colored drinks I had mentioned. Sweet and sweet make a deathly diabetic combination. Boring. Nerdy. Ignorant. Call me any or all of these and I will agree with you. 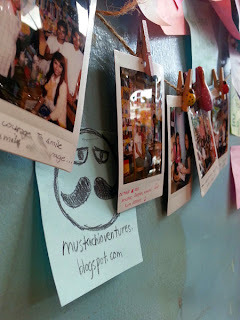 Boring because I'd rather go to museums than malls. Nerdy because I like learning (but have no patience to read the lengthy descriptions in an exhibit). Ignorant because I didn't know until early this year that we have the Museum of the Filipino People. 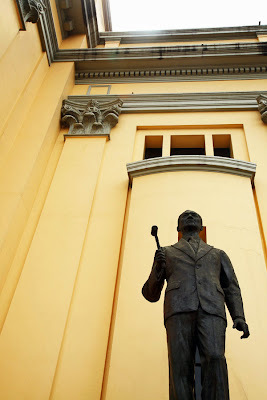 The Museum of the Filipino People is part of the National Museum. It is in the old Finance building located behind the National Art Gallery. commercial photography, videography, and tripods. 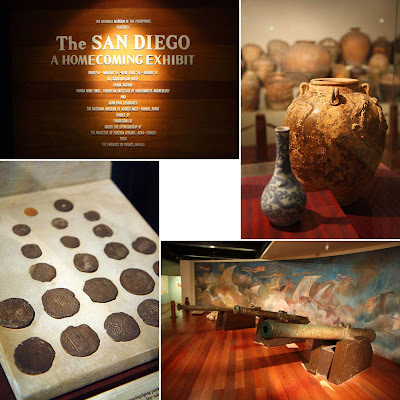 The San Diego was a galleon built in Cebu in 1590 by Spanish, Chinese, and Filipino shipbuilders. 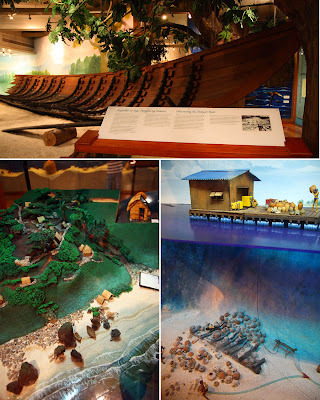 It sunk near the province of Batangas in 1600. The wreck was discovered in the early 1990s with more than 30,000 artifacts recovered. 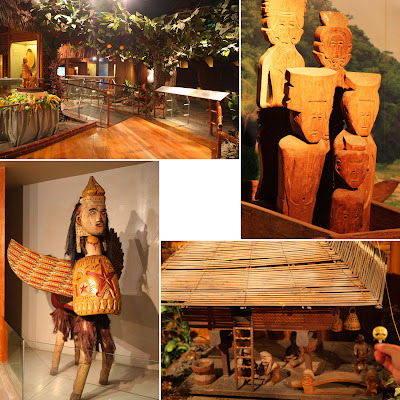 The exhibit toured around the world before becoming a permanent exhibit in the Museum of the Filipino People. This gallery contains a collection of burial jars and vessels unearthed from various caves around the Philippines. 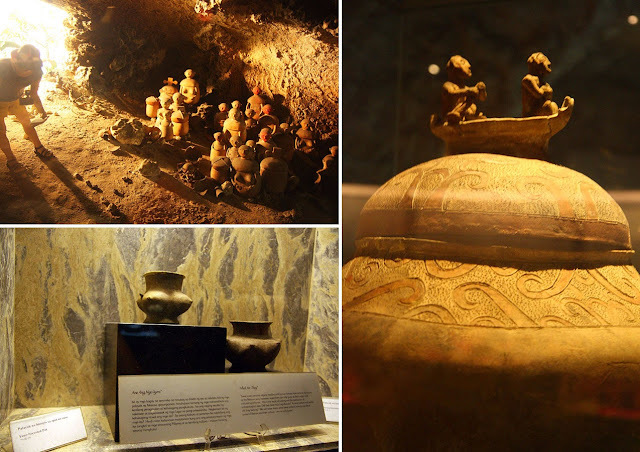 Here, you will see jars and pots of different designs (there were burial jars shaped like heads) and learn how our ancestors buried their dead. 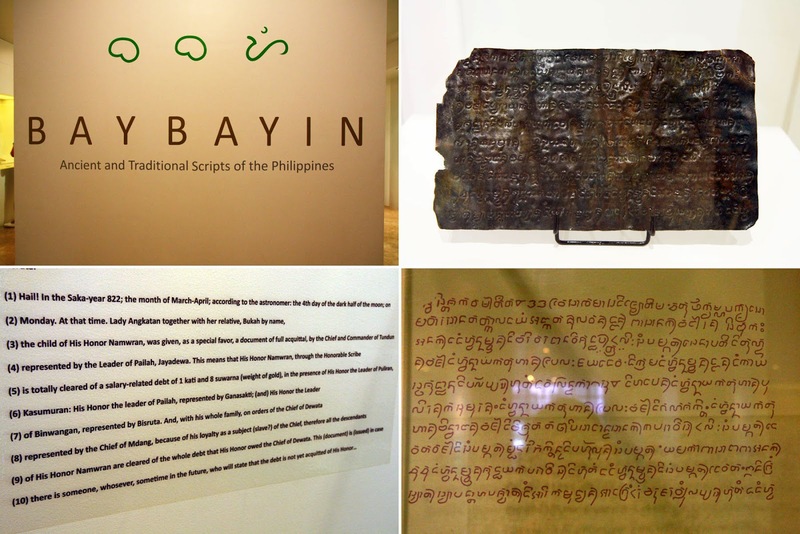 An exhibit about the different ethnolinguistic groups in the Philippines. My favorite gallery! The Laguna Copper plate and its translation (click to enlarge). I am truly glad we have the Museum of the Filipino People and the National Art Gallery (can't say anything about the National Planetarium because I have not been there). Great job curators! When in Manila, I encourage you to spend a few hours at the Museum of the Filipino People and the National Art Gallery. I am no art expert, I am just an art gawker. 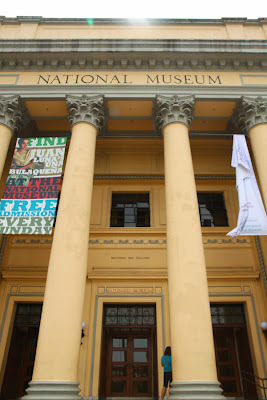 When in Manila, a visit to the National Art Gallery at the National Museum is a must for art lovers. Taking photos is allowed but no flash photography, commercial photography, videography, and tripods. The National Art Gallery is housed in a grand old building that was originally designed to be a public library, then transformed into the Legislative Building. It was only in 2003 that the building was renovated to become the National Art Gallery. 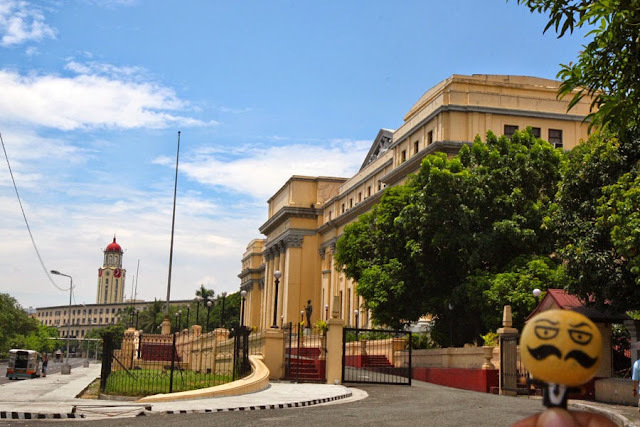 There are eleven galleries in the National Art Gallery exhibiting the works of Juan Luna, Felix Resurreccion Hidalgo, Jose Rizal, and Fernando Amorsolo, among others. Regrettably, I only had time to see to see one gallery and I chose to spend my very limited time in the Hall of the Masters. Two works of art that have been declared as National Cultural Treasures can be found in the Hall of the Masters: Juan Luna's Spoliarium and Felix Resurreccion Hidalgo's La Tragedia de Gubernador Bustamante. 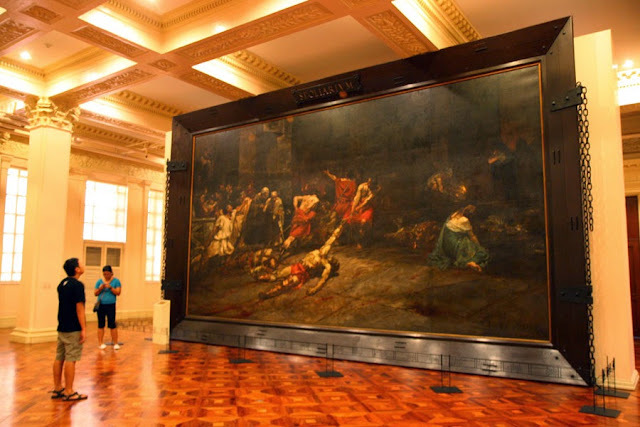 Juan Luna's Spoliarium received a gold medal in the 1884 Madrid Exposition. I know the Spoliarium is big, but I did not expect it to be that big. 4 meters by 7 meters! I just stood back, opened my eyes as wide as I could, and tried to take it all in. How I wish I had the whole day to spend at the National Art Gallery, but for the few minutes I had, I am glad to have spent it being dwarfed by Juan Luna's Spoliarium. The Saturday afternoon I brought myself to Torta og Uban Pa's doorstep, they had torta (of course! They wouldn't call themselves Torta og Uban Pa if they didn't have torta). 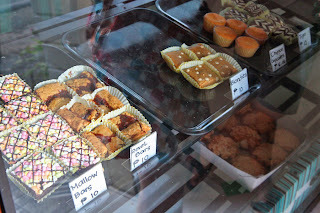 The "og Uban Pa" (and others) were cake bars, cake pops, and chiffon cupcakes. I was disappointed that Torta og Uban Pa didn't have the "og Uban Pa" I came here for: cupcakes. All your fault Babe for Food, for posting all those pretty cupcakes on your blog! Okay, maybe it's my fault for going nine months after reading that post. But let's look at my health's bright side: I won't have to go on a cupcake eating spree. 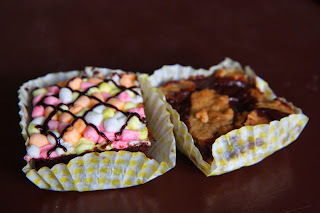 While I was mulling over what to buy, a kid came by and bought a mallows bar. So that's what I had (when it takes me too long to decide, I will have whatever the other customer is having :D) and a revel bar (the chocolate that oozed through the cracks was calling me). 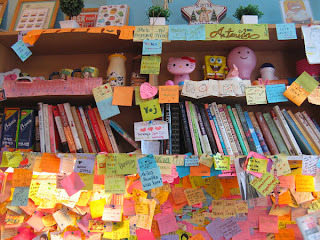 The place is named Torta og Uban Pa, that tells me I should try the torta, too. 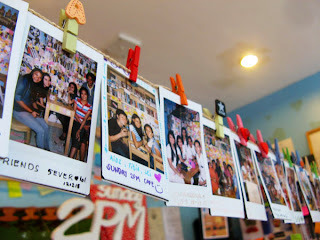 Kids would probably love all the mallows on the mallows bar but for me, on the whole, it was nothing fancy. The revel bar on the other hand, I loved. It was chewy and chocolatey. And the torta? 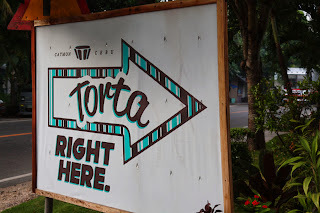 I never liked torta because I always see it as oily cake. But that's torta from Argao. This torta from Catmon is crispy on the outside, soft on the inside, doesn't crumble, and is not at all oily. 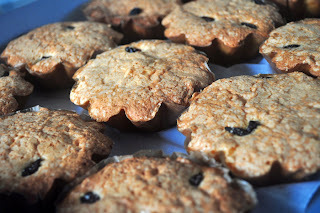 Presently Torta og Uban Pa's cupcakes are on order basis. 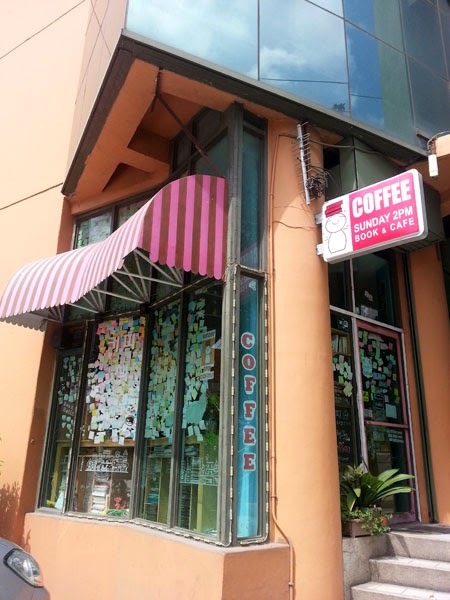 Good news is, even if they are based in Catmon, 58 kilometers from Cebu City, I (and you, too!) 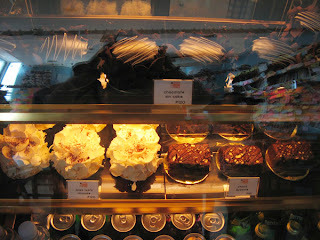 can place an order (be it cupcakes, cakes, or torta) and orders can be picked up in the city. Yahoo! 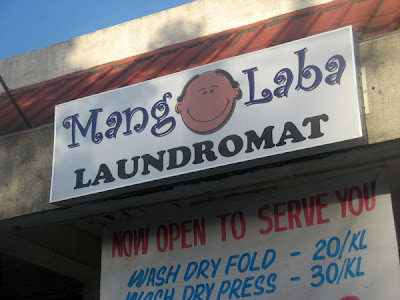 * If you're coming from Cebu City, this is on the right side of the road, across Community Rural Bank of Catmon. was disappointed when it turned out to be dark green. 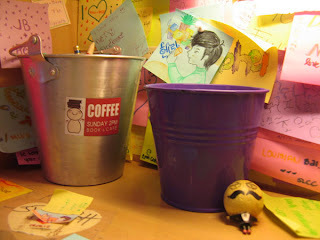 was awed when it turned out to be huge!